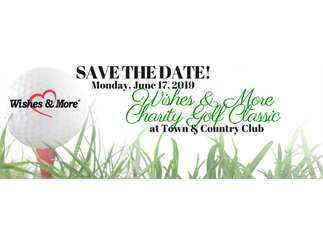 We invite you to participate in the 2019 Wishes & More Charity Golf Classic! This event sold out last year so we encourage you to register early and enjoy a day on the links at the legendary Town & Country Club while supporting the kids and families of Wishes & More! There will be plenty of opportunities to win - team & individual golf prizes, a live & silent auction and fun drawings with great prizes. Join us for a great day of golf for a great cause!